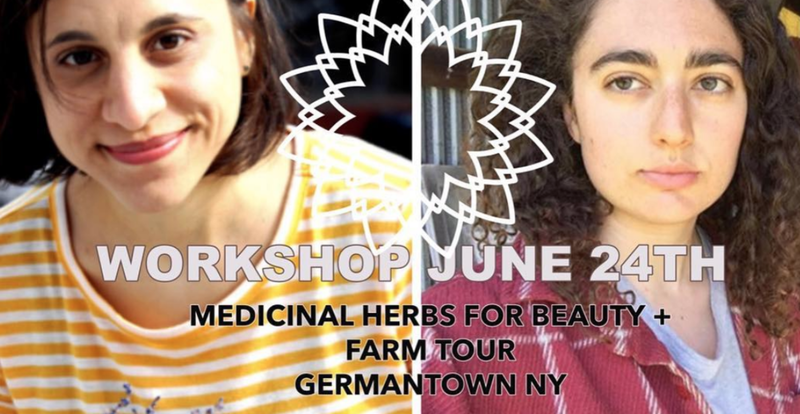 Join herbalists Maria Christodoulou and Aviva Tilson in Germantown, NY for a special herbal beauty workshop. Learn about medicinal herbs in beauty care that balance skin tone, improve circulation, and create shine. Walk through an organic herb farm and learn about helpful gardening and harvesting techniques. Maria will discuss five herbs in beauty care that support healthy skin - starting from the inside. Why? Because the foods we eat play a direct role to how healthy our skin looks. Aviva will take you on a walk through her herb garden and discuss how cultivated and wild plants are beneficial for your skin, as well as common ways to extract their active constituents. Participants will make a sachet of fresh organic herbs from the farm to take home and make your own medicine with. This workshop includes an in-depth exploration of each herb and a hands-on activity gathering fresh herbs to take home for participants to create a their own beauty product. Join us for an herbal experience and indulge in your natural beauty.